An easy, warming dessert that brings out the sweet goodness of rhubarb. This is a very basic rhubarb recipe. Once you have learnt how to cook the rhubarb so that it’s soft but not mushy – so it still holds its shape – you can experiment with different flavours in the poaching liquid, and other ingredients to serve it with: blueberries, cinnamon, ginger and apples are a few favourites. 2. Pour the sugar and water into the saucepan and heat on low, stirring until all the sugar has dissolved. 3. Add the lemon rind, rosewater and rhubarb, and simmer over low–medium heat for about 10 minutes, until quite tender but not mushy. Remove the lemon rind. 4. Combine the yoghurt and honey in the mixing bowl. 5. 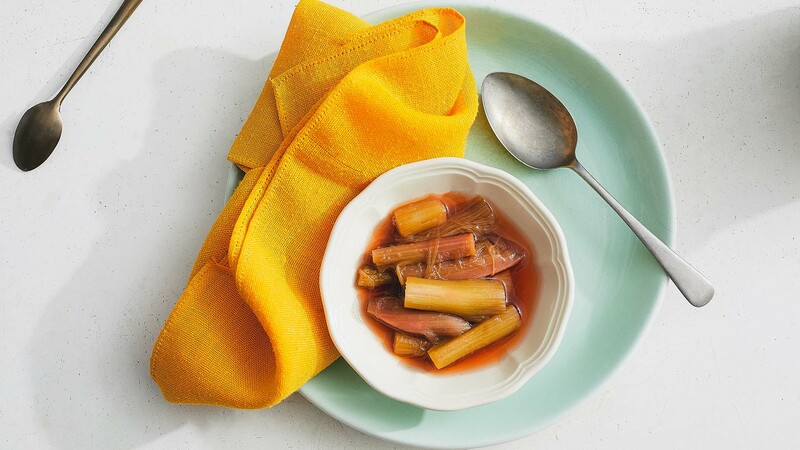 Transfer the rhubarb from the syrup with the slotted spoon onto a serving platter. 6. Serve the rhubarb with the flavoured yoghurt drizzled over the top.